SDS participates in the justice for Kofi march. Gainesville, FL - Over 400 angry protesters - a coalition of students, local residents and university professors - rallied and marched to protest the racist police shooting of Kofi Adu-Brempong. Adu-Brempong is an international graduate student from Ghana who was shot in the face by a University of Florida policeman. After receiving a call from a neighbor concerned that Adu-Brempong was screaming, due to stress over his studies and his immigration status, campus police stormed his apartment, tased him three times and then shot him in the face with an assault rifle. Gainesville Area Students for a Democratic Society (SDS) led the campus action. 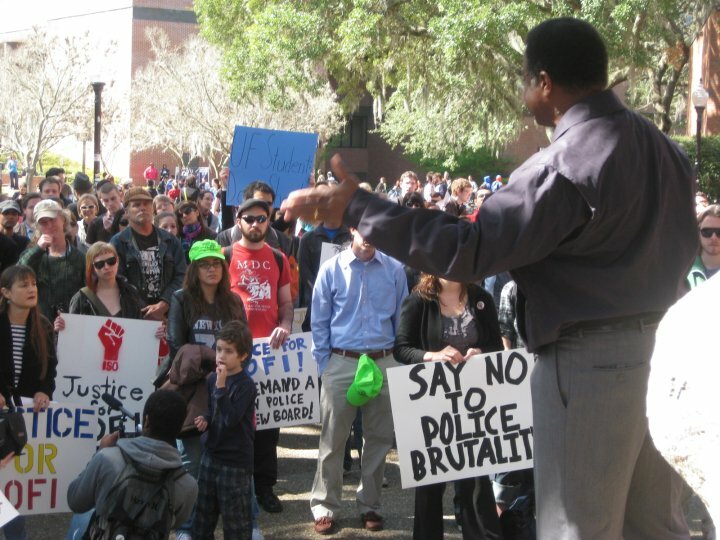 Beginning with a rally and speakers at Turlington Plaza, the mass of protesters marched through campus to the Board of Trustees in the Emerson Hall Alumni Building. The Board of Trustees governs the entire university. Since the building was closed to the public, the protesters pulled the doors open, pushed past security and took over the building. They presented the board with a list of demands, including dropping all charges against Kofi Adu-Brempong. The other important demand is the firing of Keith Smith, the officer who shot Kofi in the face. In 2008, Keith Smith was given a verbal warning by the Gainesville city police department where he previously worked. Smith and three other police officers were throwing eggs and harassing African Americans in the local community. The university police ignored this warning and hired Keith Smith. As the students settled in, waiting to see how the Board of Trustees would respond, tension rose inside the boardroom. After a half hour, a trustee came out to speak to the protesters. Following his lead, the students proceeded to give speeches about stopping police brutality and continuing the fight for Adu-Brempong. An hour later, the protesters decided the demands of the coalition were clearly received by the board and left the building. Late in the afternoon, the student protesters attended a student government meeting to demand a resolution calling for a grand jury investigation of the racist cop. With some persuasion, the resolution passed. With protests heating up in Gainesville, the Coalition for Justice Against Police Brutality vows to continue the fight for Kofi Adu-Brempong. It is slightly old news by now, but after about 6 months of work, we were able to get Aramark to sign an agreement with the CIW that will help improve the lives of thousands of farm workers in Immokalee Florida. It is definitely one of our biggest accomplishments, and one we are definitely proud to have played a large role in. Gainesville Area SDS had been involved before with the CIW, back when they were focusing on Chipotle and Subway. I attended a protest with some CHISPAS people outside Chipotle, and several of us gave letters to the management of Subway next to the old Civic Media Center, but that's about it. We didn't really kick things off till the Fall of 09, when some of our people went down to Immokalee Florida. They would come back and form a chapter of the Student Farmworker Alliance. One of the first things we did to kick the campaign off was to submit a piece of legislation to Student Government asking for Aramark to sit down and meet with the CIW. It met with fierce opposition from some members of the majority party, and was unable to get the necessary 2/3 requirement for it to pass. After the election cycle was over, we resubmitted and got the necessary support the next time around. It was a major victory for us, one that other campuses would replicate and something we would put on a lot of our literature. Our first major protest happened on October 24, 2009. The Alligator reported “over 100” people were at the protest, but it seemed more like 150 to me. It was a Saturday morning, which made it slightly more difficult to get students out, but older community members and a bus load of people from the CIW more than made up for it. We marched from the Plaza of Americas to the Reitz Union, where we heard speeches and went to the Gator Dining offices to leave information. We then went to Gator Dining and chanted outside there for awhile, before going to Publix. It was an exciting day, and got a lot of us pumped up to do more. At later meetings, we would frequently discuss the idea of how to escalate our tactics to the next level. One of the more powerful ideas we came up with was to create a pamphlet directed towards the Preview students, informing them about the nature of Aramark services on campus and directing them to other sources of food, including free food (which there is a lot of in Gainesville). Some of our people were asked to leave the first couple of time we did this to the Junior level transfers, but Aramark didn't seem to take this very seriously until we did it to the incoming group of Spring Freshman. I had the cops called on me by two different people when I refused to leave. We had another major protest on February 10th, following a failed meeting attempt with the local Aramark representative. We chanted and marched around the Reitz Union, and refused to stop when one of the Reitz Union managers tried to grab our people. Though smaller, this protest was more militant than the last one and I believe played a large part in showing the administration we were dead serious about our threats of escalation. When we finally met with the “Big Whigs” from Aramark, they realized we weren't just a group of stupid kids who they could make go away. Shortly afterward, we were informed that their cave was imminent. Aramark apparently cited us as a significant source of pressure for why they caved to the CIW. The lesson, I think, people should take away from this is the need to continuously escalate. Raising awareness about the issue isn't simply enough: you have to be prepared to demonstrate and to take some direct action against your target that will hurt them financially. Every person we convinced with our fliers not to buy the meal plan cost Aramark $2,000, and our conservative estimate is we convinced about 20-30 students not to do it. Money is the language these people speak, and paying $20 extra for every ton of tomatoes they purchase is a lot cheaper than ignoring a campaign like the one we waged going nation-wide against them. I would recommend campuses everywhere replicate our campaign. Many people told us our Aramark campaign was hopeless, as they were a pretty stubborn company. It only took us 6 months to force them to meet with the CIW. It probably won't take very long to take companies like Sodexo down with these same tactics, especially if practiced on a much wider scale than our single campus. • Saturday, March 20—Washington DC protest against the war in Iraq hosted by the ANSWR Coalition. - Discounts with AVIS, 7 passenger van for $122 (including limited liability and unlimited mileage) for the entire event. - It will be up tonight. • Titusville rally in opposition to potential NASA privatization by AFL-CIO national office. 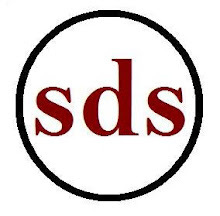 • Youth and Young Adults (Farmworker Group) wants to affiliate with SDS. • Beto read off several conditions, which SDS already meets. • The group agreed to allow YAYA to affiliate with SDS in Gainesville. • Essentially a subcommittee taking on SDS’ labor issues. • Richard will head up the planning on the Day of Action. • Justin will contact the Alligator on getting press on the event.